Cruises from San Juan depart year-round. 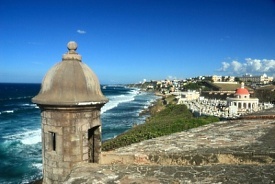 Old San Juan is rich in Spanish tradition, with cobblestone streets and colonial architecture. This part of the Puerto Rican city is easily seen on foot, and cruise passengers can shop for handcrafted works or relax in a shaded park. New San Juan is distinctly elegant with lavish resorts, great restaurants and grand casinos. Visitors in San Juan can join an excursion to El Yunque, the only tropical rain forest in the U.S. national forest system. Adventurous travelers will want to partake in a deep-sea fishing, snorkeling or diving excursion. Carnival passengers use the Old San Juan Pier. Traveling from the San Juan International Airport - Take Baldorioty Avenue. Follow Baldorioty Ave. to San Juan (follow the signs). On the right, you will see a sign for Puentes Dos Hermanos (Condado Lagoon); stay in the left-hand lane and you will enter Puerta de Tierra. After three traffic lights, you will see the waterfront. Continue on Concepcion de Garcia Ave. until you reach the port. Celebrity, Norwegian, Princess and Royal Caribbean passengers use the Pan American Pier. Traveling from the San Juan International Airport - Take Baldorioty Avenue. Follow Baldorioty Avenue to Puentes Dos Hermanos (Condado Lagoon). Stay in the left-hand lane. After U-turn stay on the right and follow until you come to a street where you can make a right hand turn. Go until you come to the first street and make a right hand turn. Follow this road and it will take you to Pan American Pier. 12 miles to pier, approximate driving time 45 minutes. There are no port parking facilities at either pier, but there is public parking in the area surrounding the port.